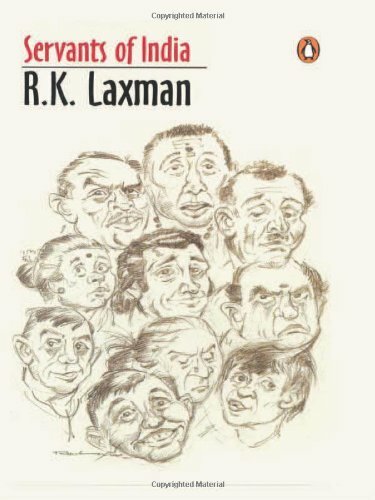 The second review again is aimed for another 'Laxman-flavour'-ed book titled "Servants of India". The reason of this line of succession is because I am reading his works one after the other at this moment. So, pardon me if you get bored. Going by the title, anyone accustomed to R. K. Laxman would assume this to be a book on the esteemed politicians of our country, but it is not so! This book is basically about the most important person in the Indian household - the servant, something that is even unheard of in our western counterparts of similar social status. For Indians, the servant of the house is of utmost importance for the plethora of activities they perform at lower rates which constantly seem to rise, and the topic is worrisome as well due to their unpredictability, inefficiency or sheer unavailability. And our dear Mr. Laxman tries to write by hand a picture of the helping hand. In a single sentence, it is a nice little book. So, this review is going to be a short and a crisp one. The first two stories were amusing enough. A crook handyman and another cook who emerge as a priest and motivational speaker after taking a well-informed leave respectively. The following stories are ordinary incidents narrated with Laxman's signature satire and sense of humour. They do give you his perspective and Indian people's outlook of the servant condition of India, but I would especially mention (not spoil!) two of his servant stories which I actually loved very much. The first one is 'Iswaran the storyteller'. It's eerie as is supposed to be, and the writing is well suited for that purpose. Apart form that, the remarkable quality of the writing lies in the fact that the writer never looses his sense of humour throughout the narrative. So, the great interest for you is that at the the end of the story you are not only uneasy but also chuckling. After that follows a nice descriptive narration with the essence of the unusual style of the cartoonist in 'Narsimha the terrible', you reach another story - 'The Saga of Ramaswami'. Here Laxman is marvellous, as he gets to describe various landscapes and diverse people, not just limited to the household arena as in the rest of the book, with his confident flair of a caricaturist-turned-writer. The imageries are really well constructed and the story, though quite simple, appeals. An American or a European might find this particular collection of writing very odd due to the topic it deals with. Being not accustomed to the way things are done in India, as the author unabashedly mentions, might arise a question like, "Why the hell!?" For example : a child of eight came in as a domestic help and the family, though was an educated one with the bread-earner being a writer- an intellectual great, never admitted the boy to school; instead his job was to play with their own kid who subsequently goes on to school. But this relation, in spite of its sheer inequality and injustice, goes along healthily and happily for a long time. One might criticise this aspect of the book, but this system of household servants is still there at large. Child labour, cheap labour rates are a handful of the big, major issues faced by India today. One has to understand that the caricaturist is just writing about the reality, what he saw around himself with a stroke of satire on the attitude of those who are around. So, on the whole if you are not bothered by the above fact, the book is a nice quick little read, and some of the story-titles are really nice. The middle section of the book is a bit boring and repetitive which gives me the impression that due to poor choice of many similar, weak stories in a book concerned with a very domestic and non-exotic topic, the effect of writing remains a bit powerless. It seems a good story teller choose a bad story to tell. But still a few are really nice, funny and great to read. So, for me R. K. Laxman's "Servants of India" earns 2.5 - 3 stars.